What is the difference between RF / FE-BGDK and RF / STEEL warp torsion? Both counts with the 7. Degree of freedom! That's right, both add-on modules expect the 7. Degree of freedom, the warping. 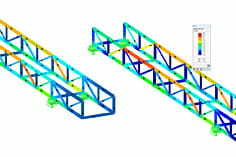 The difference is that in FE-BGDK only the loads which directly affect the set of bars are automatically detected. Loads from other components that have an indirect effect on the dimensioning rod set must be entered as additional loads. In FE-BGDK a complete recalculation of the system takes place. 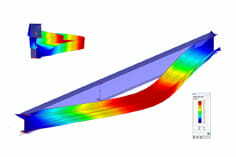 STEEL Wölbkrafttorsion analyzes the cutting force curves from the calculation of the respective main program and then calculates the loads back. These are then recalculated and calculated. This eliminates the input of the load, which represents a time savings.